A 33-year-old man has been charged in connection with the hijacking of a Metro bus in Dundonald on Saturday night. The driver of the Translink bus was threatened by a man armed with a knife at the bus stop on Cairnsmore Avenue in Ballybeen shortly before 8pm. The man forced the bus driver to drive for a distance before forcing him and several passengers off the bus at knifepoint. Police said a 33-year-old suspect was arrested in Millars Lane a short time later. He has since been charged with a number of offences including hijacking, aggravated vehicle taking, possession of an offensive weapon with intent and driving whilst unfit. He is expected to appear at Downpatrick Magistrates’ Court tomorrow morning. A Translink spokesperson said eight passengers were on the 4A Metro bus at the time of the incident, but there were no reports of any injuries. 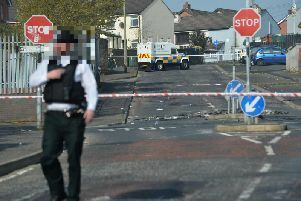 “After the incident, services were suspended in the Ballybeen area whilst the incident was investigated, however normal services were resumed later in the evening. “We totally condemn any threat to our staff or customers and are assisting the PSNI with their investigations into the incident,” the spokesperson said.